Before I dive into why I believe in an alternative P&L, let’s talk about struggles. One of the very first struggles a novice entrepreneur usually has is to see his baby growing at the pace he expects. Most of the time, nobody hits their estimates and that brings frustration and hesitation. That was our case for years with MarketGoo. We had validated the market, we had a robust platform, a healthy channel distribution with several agreements and a good enough product. Still, our results and growth were poor. I remember sharing my frustrations with an industry peer at a party and he advised me to keep nurturing the agreements we had so they’d reach a return. And that was the case, but it took us years instead of months to reach a cruising-altitude. During those hard years where growth was timid, we started to feel that even though numbers weren’t growing, we were getting more accurate feedback from our actions and projects. Not only that, we managed to shape and build the foundations of our Culture. We improved the use of methodologies (Scrum, KPIs, etc), created several different products and tested different channels and strategies. Our brand recognition grew within our industry and we started to see growing interest … but our revenue growth was still very very low and sometimes we even saw a decrease. Every month I write a company update email. This exercise forces me to reflect on things at a higher level. Figures were quite plain but the team feeling was improving, and that has taken form in one of our strongest company values: Wisdom Growth. It’s hard to measure how your wisdom is growing but the feeling is undeniable. And not only was wisdom growing, our team was more confident, our turnover was minimal, our innovations were increasing. Along with Wisdom Growth, we used all those slow growth years to build Trust. Trust with our team members and trust with our Partners and customers. As we had no external pressure (i.e. VC funding) we had not been exposed to accelerated business growth. That kind of growth that makes you pivot or burn money as you burn trust. As an Entrepreneur, I’ve spent several hours with other peers confronting my reality and my fears. And I can tell you, most of the people are (or have been) full of fear and uncertainty. Most bad experiences come from managing cash flows and financing growth in the wrong ways, or depending too much on one project. That was one of the reasons why we’d been reserving part of our free cash-flow – to increase our peace of mind but at the same time adopting a growth mindset. The secret is, as always, in the balance. Invest in growth but stay guarded. What could go wrong? This serves as a mental model to identify the threats and be prepared. That’s why I always believed in another type of P&L. One where wisdom, trust and peace of mind added assets to the company. 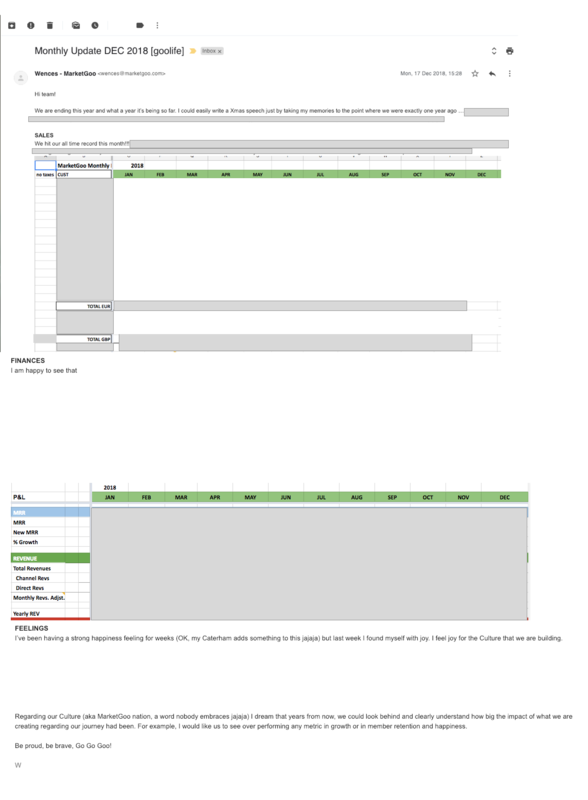 So in my team monthly updates, I tend to share financials but also feelings. 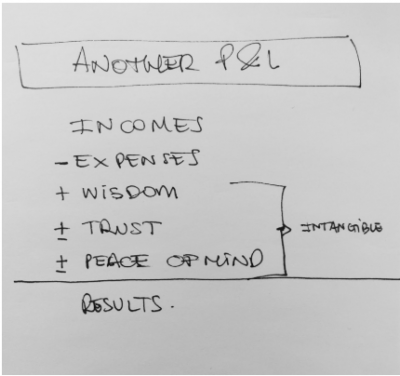 So in your darkest nights as an entrepreneur worried about cash and growth, try to measure your P&L with all these intangible components to have a sense of progress and faith or a sign of surge. Below is an example of the monthly e-mail I send the team. Excuse the redactions (after all, I can’t give all our secrets away! ), and I hope it serves as a template for those wondering where to start with this.